Neuron wrote: Thank you, Tosta, you are welcome to post more singles missing on the list so that we have more material to spot the sets. I'm working on it presently. In the meantime, can you elaborate on something you said above? Neuron wrote: Did you check them for the black dot on the back? I don't see any other mention of a black dot in this thread, but I take it there's some significance to it. Can you explain, or point me to an explanation if one is posted elsewhere? Italian FWB cards always have it, Italian FWB never. For that, the Italian list effectively obsolete, I created it before I found this way of telling the cards apart. German FWB cards always have the dot, German 4th Edition cards exist both with and without. Thus, cards without the dot are 4th Edition for sure. I also notice that Fuoco Fatuo (Will-O'-The-Wisp) is incorrectly listed in the 'Red' section in the top post. It is a black card. Also thanks to tryst for his contributions! Italian FWB cards always have it, Italian FWB never. I have one copy each of Pianura (Plains) and Scarica Elementale Rossa (Red Elemental Blast) that are FWB, going by the dot above the 'i' in the card name. They lack the black dot on the back of the card. Are there any other known exceptions to the black dot correlation? I can imagine many reasons why basic lands might be exceptional; far fewer for the Red Elemental Blast. Here is Kreuzzug (Crusade). Left is FWB; right is 4th Edition. Identification is based on the height of the descender in the 'g' in the card name. No other differences are obvious. Here is Zorn Gottes (Wrath of God). Left is FWB; right is 4th Edition. Identification is based on a careful comparison of the heights of the card names. No other differences are very obvious. The best indicator I've spotted here is the 'i' in the word "im" in the rules text. On the 4th Edition card, the bit of texture in the background runs cleanly between the dot and the beak of the letter 'i', while on the FWB card it runs through the dot. Wow, I didn't know of Italian FWB cards without dot. That makes the list relevant again, fortunately, I haven't deleted it. Now it's the question whether there are dot and no-dot variants of all cards or if the sheets were just missing the dot on a few slots. Do you have other FWB REB's to compare? Tosta Dojen wrote: Here is Zorn Gottes (Wrath of God). Left is FWB; right is 4th Edition. Identification is based on a careful comparison of the heights of the card names. No other differences are very obvious. Lists are updated. Your Ombra Infernale is identified to be 4th Edition. Neuron wrote: Now it's the question whether there are dot and no-dot variants of all cards or if the sheets were just missing the dot on a few slots. I suspect it's the latter. I have somewhere around 40 white-bordered Italian cards that I can easily identify through other means (the 'i' or 'j' in the card name, or from existing in only one set or the other) and nearly all of them match up the way you described: FWB has the dot, and 4th Edition lacks it. 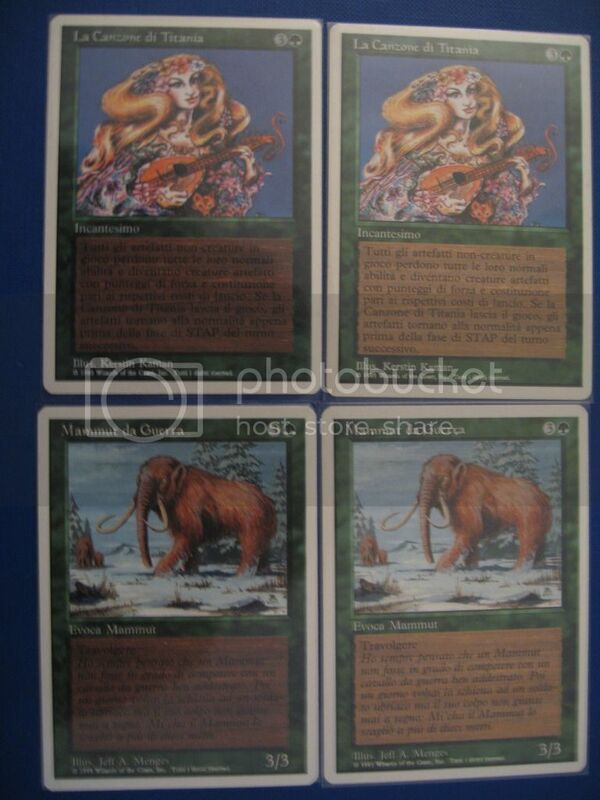 The two cards I posted, along with another illustration of Pianura, are the only exceptions I've found. If all the cards had both variants, I'd expect to have a lot more discrepancies. Do you have other FWB REB's to compare? I have two others: both have the black dot that you describe. Here is Balance. Left is FWB; right is 4th Edition. Identification is based on the a careful comparison of the heights of card names, supplemented by the presence or absence of the black dot on back, and a slight difference in color. No differences in wording are apparent. Here is Schwerter zu Pflugscharen (Swords to Plowshares). Left is FWB; right is 4th Edition. Identification is based on the a careful comparison of the heights of card names, supplemented by the presence or absence of the black dot on back, and a slight difference in color. No differences in wording are apparent. That 'g' in the card name is a pretty tricky one; the drop shadow makes it tough to use as a distinguisher. Here is Nachtmahr (Nightmare). Left is FWB; right is 4th Edition. Identification is based on the a careful comparison of the heights of card names, supplemented by the presence or absence of the black dot on back, and a slight difference in color. No differences in wording are apparent. This one's pretty tough; I had an easier time seeing the height difference in the distance between the mana symbols and the top border. All added! White and black cards are almost complete now! cataclysm80 wrote: Regarding the Italian FWB cards. It may seem simple to identify them by using the lowercase i, or some of the other tips at the beginning of this thread. 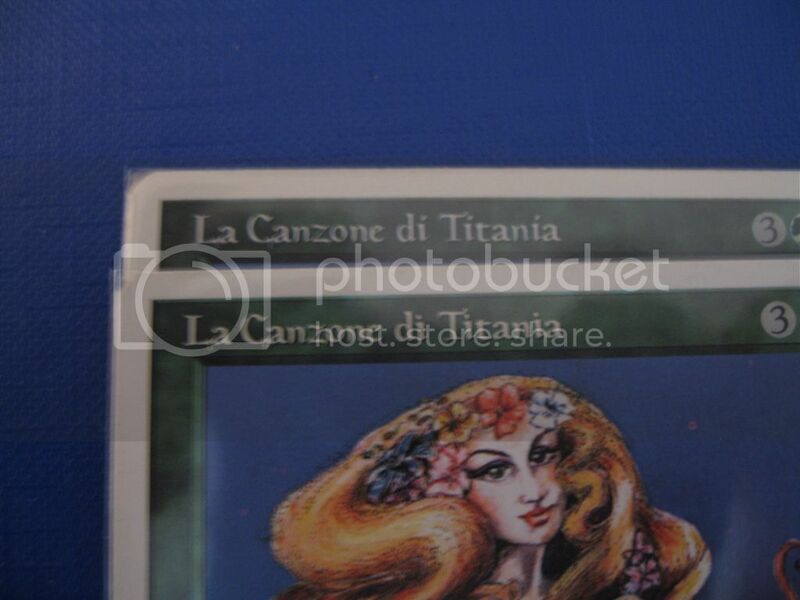 However, as shown by the picture of the Channel, there are two versions of at least some of the Italian FWB cards. Originally, I had thought the differences may be linked to the bolder copyright seen on some Italian FWB cards, but it seems this is not the case. My current theory is that this only affects green cards, but possibly not all of the green cards. It seems that in the first release of Italian FWB, the green cards had dark colored text boxes. They also had the slash over the lowercase i like the rest of the cards in Italian FWB. The artist proofs are this version with the dark colored text box. Then it seems that at least some of the green cards in Italian FWB (maybe all of them?) were corrected to a lighter colored text box. 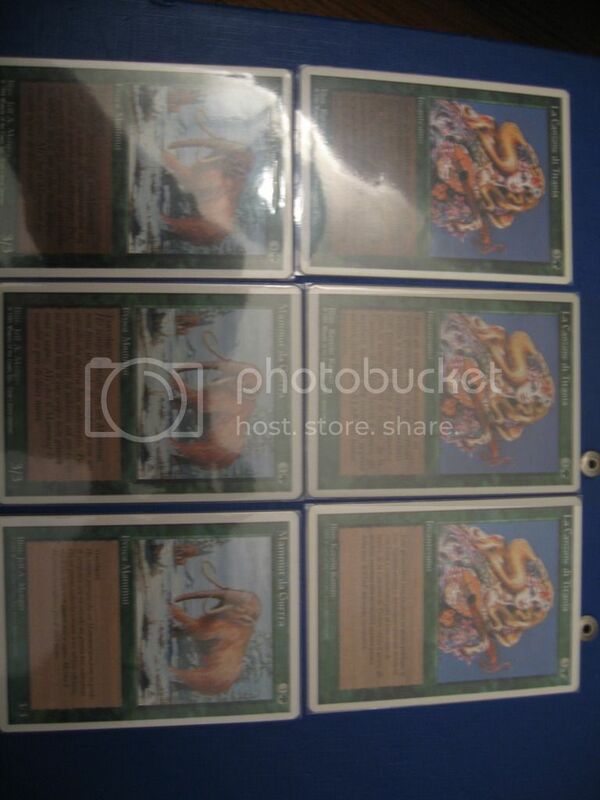 This correction happened after the font change to round dots over the lowercase i, so at first glance, you may think that these cards are 4th edition cards. They are not. Their rules text remains identical to FWB, not the updated 4th edition text. You would need to know which text went with which set in order to identify your card. For the reasons listed above, I suggest that we add all green Italian FWB cards to this list of cards which can be difficult to identify. As shown above, Channel has two Italian FWB versions. I've heard that Lure and War Mammoth also have two FWB versions. It would be nice to have pictures. Maybe we will find more if we start to look. If it exists, I'm looking for an Italian FWB Scryb Sprite with the light colored text box. With Scryb Sprites, the rules text is very similar between FWB and 4th, but there is a slight difference if you look closely. The rules text has 8 lines. On the 6th line of text, is the word "certa"
The FWB cards have a comma after the word like this "certa,"
The 4th cards have a colon after the word like this "certa:"
I'm looking for the FWB with a light text box, round dots of the i in the card name, and it will have a comma after the word certa, indicating that it is a FWB card and not 4th.